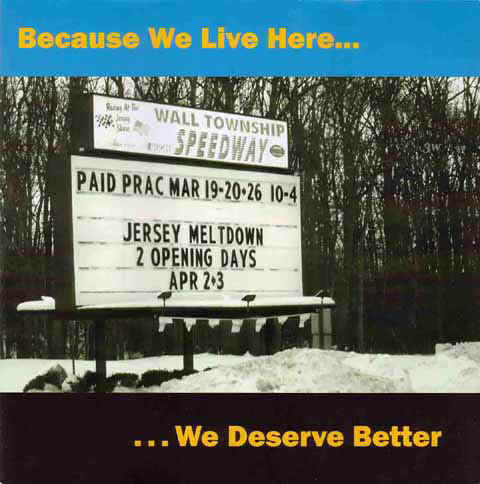 New Egypt, NJ (December 27, 2005) -- After reviewing the current rule book and vendor contracts, New Egypt Speedway management has made very few changes in existing rules for the 2006 season -- a fact that should please most of the racers who regularly compete at the half-mile dirt tri-oval. The same tire rules will remain in effect, with American Racer spec tires mandatory in the Modified, Sportsman and Super Stock classes. Hoosier will continue to supply the tires for the SS Sprint division. Both NES spec tire brands can be purchased through Pit Stop Tire Service in Frenchtown, NJ, (908) 996-7288. As has been the case for the past eight years, Pit Stop Tire Service will also have a tire truck at the track on all race nights. One major change for 2006: the speedway will no longer seal Sportsman or Super Stock engines. violation, a substantial fine may also be imposed." All Sportsman and Super Stock motors are required to have a one-inch diameter inspection plug in the oil pan. Updated 2006 rules for the Super Stock and SS Sprint classes are now available for download on the Driver Standings page of the official track website, www.newegyptspeedway.net. Modified, Sportsman and any procedural rule changes will be updated and released by January 20. For more information about the 2006 rule book, call the track office at (609) 758-1900 and leave a message. The office will be closed for business until January 11. William N. "Wimpy" Tasnady, 74, of Vineland died Saturday evening, Dec. 17, 2005, at Kindred Hospital in Philadelphia. Born Dec. 9, 1931, in Manville, he was a son of the late Steven and Margaret (Batcho) Tasnady and was a lifetime resident of Vineland. Wimpy was a service manager for several automobile agencies and a maintenance mechanic for several food processing plants in the Vineland area, retiring from Casa di Bertacchi in 1998. He served in the Korean War from 1952 to 1954 as a United States Army corporal, and received the Korean Service Medal with two Bronze Stars, a United Nations Service Medal and a National Defense Service Medal. Wimpy's joyful laughter, sense of humor and love for his family always will be missed. He is survived by nieces and nephews, Claudia Tasnady Federowicz and husband Richard of Flemington, Roger Tasnady and wife Betty of Kenvil, Carolyn Lawrence of Lowell, Mich., Peggy Chambers of Clovis, N.M., Gail Proulx of Pennsylvania, John Tasnady of Netcong, Karen Uhlig and husband Dave of Centreville, Ohio, Robert Tasnady and wife Ina of Hampton, Va., Virginia Pickering and husband Terry of Flemington, and Kami Tasnady of Winston-Salem N.C.; a stepsister, Dora Mock of Flemington; and many grandnieces and grandnephews. He was preceded in death by five brothers, Steven, Joseph, Edward, John and Alex; a niece, Adrienne Tasnady; and a stepbrother, Daniel Chonko. Private graveside services will take place at the convenience of the family at Keokee Chapel Cemetery in Paradise Valley, Pa., where he will be buried with his brother, Alex. Arrangements are under the direction of William H. Clark Funeral Home, 1003 Main St., Stroudsburg, Pa. Condolences may be sent to www.wmhclarkfuneralhome.com. Our condolences to the Tasnady Family. He is survived by a daughter, Janel, two sons, A.T. Jr. and James. He is also survived by two sisters. Our condolences go out to the Consoli Family. Technique with Jay Castimore, Brake Adjustment and Maintenance presented by Wilwood Brakes, Marketing and Sponsorship, and a special Question and Answer Round Table with Dirt Racings Top Stars! Kirkey Racing Seats, Arts Radiator, Wilwood Brakes, Winters Performance Products, The Joie of Seating and JD3Graphics. In 2005, over 250 racers took part in the first annual seminar. Among them was Mike Colsten who took home the 2005 Teo Stage 2 Frame  Participants will once again be able to participate in a drawing for various door prizes including a 2006 Teo Stage 3 Frame  the same adjustable torsion rack car that has been the buzz of the industry. Almost half of the seminar has been filled already and the other half is filling up quickly! BRIDGEPORT, NJ (November 24, 2005) - Hot off the heels of a successful season at the Bridgeport Speedway, officials took the time over the Turkey Chase weekend to discuss and go over the 2006 rules and scheduling package. The current package not only introduced a new 358 Spec Small Block motor but bolstered the division with the opportunity to almost quadruple the current payout. taking a huge step in the right direction when it comes to cost vs. payout in certain divisions - while still maintaining the high level of competition and 'top notch' modified action in our premier Big Block Modified class ." The 358 Spec Small Block (nicknamed "Crate 2"), which was tested in an actual racing environment last year, will see solo action; co-headlining Friday Night competition with the Limited Sprint Car Division (formerly the Jasper Sprint Cars). The 600cc Micro Sprints along with the 270cc Micro Sprints and 4-Cylinder Stock Cars will seek action on the 1/4 mile speedway from April 14th to September 1st, whereas Friday Night action on the 5/8 mile speedway will take place from May 26th to September 1st. The Champions in all Friday Night Divisions will be crowned on September 1st. The 358 Spec Small Block boasts a $5,500 motor and options to increase performance include an open carburetor, open shock package, aluminum wheels and a 2400 lbs. weight minimum - while a $1,200 winners share will entice competitors to participate in the newly created division. In Saturday Night action, a substantial Small Block Modified bonus will be awarded to the highest finishing Small Block in each Big Block Modified feature event. The GM Crate Sportsman will make the move to Saturday Night and the Outlaw Stocks will remain in their current time slot. The most significant change will be to the current Sportsman division. Re-dubbed "358 Small Blocks," competitors in the Friday Night Spec Small block class will be given the opportunity to compete against the current Sportsman on Saturday -- while both classes maintain their normal rules packages. In an added twist, events in the newly re-named "358 Small Blocks" will see the winner's portion boosted to $1000 - making it the highest paying Sportsman win in the area. "We want to give these guys the opportunity to race for some decent money," Track Owner Jay James stated. "The guys purchasing our 358 Crate 2 Small Block will be given the opportunity to race for $2200 over the course of a weekend, without making the unnecessary tire, wheel, shock and carburetor changes - and at the same time, those that were our Sportsman competitors will receive a 25% winners payout increase." Bridgeport fully supports the investigation of decreasing cost in the racing community; however we have made a promise to our fans to maintain a superior level in the Big Block Modified division. "We want to keep our Modifieds in the top level of competition without hindering speed," Track Owner Jay James explained. "The idea to keep costs down has been the primary concern for us since we started here, which is why we've looked to economical motors to do that, but the costs necessary to reduce the weight of a Big Block Modified are un-reachable to many low budget teams - and the thought of adding weight to the open Big Block Motors is detrimental to the speed that attracts fans to the Bridgeport Speedway." Similar to 2005, various touring series' including the URC Sprint Cars will be brought in to highlight 2006 racing activities. For more information pertaining the 358 Spec Small Block motor please contact the Speedway Office at 856-467-4408, rules packages for all divisions will be available online at www.thenewbridgeportspeedway.com in the upcoming weeks. New Egypt, NJ (November 5, 2005) -- New Egypt Speedway racers celebrated the end of the 2005 season in high style on Saturday night, with $54,500 in point fund awards being distributed during the track's gala annual banquet, "Evening with the Stars," at the fabulous Bally's Park Place Casino in Atlantic City. Thirty-eight drivers in five divisions shared the all-cash point awards and the night's honors. Modified champion Frank Cozze of Wind Gap, PA -- who hightailed it to the awards ceremony after finishing sixth at the Syracuse mile earlier in the day -- was the top honoree: Cozze's consistent string of 21 top 10 finishes in 23 starts won him the $10,000 point fund bonanza and his second New Egypt track title in the past three years. Young Rich Rutski of Somerville, NJ, claimed the $3,000 Sportsman division title, his first at New Egypt. Wall, NJ's Rob Ormsbee repeated in the Super Stock ranks, taking the $1,500 championship for the second year in a row. Also claiming back-to-back titles was Art Liedl Jr. of Flemington, NJ, in the Haldeman Ford DIRT SS Sprint division, while Randy Yaple, Ewing, NJ, topped the Rookie Sportsman Series and collected $750 from sponsors Advantage Financial and Cradle Rock Developers. In addition to the cash awards, the top guns in all divisions also received trophies courtesy of Sunoco Racing Fuels and championship jackets from American Racer distributor Lias Tire and Hoosier Tire East. Before a crowd of over 450 celebrants, New Egypt's "dynamic duo" of Nick Leach and Pete Wortman served as black-tie masters of ceremony for the evening, which also honored many drivers in special award categories. Most Improved Driver Awards went to John Keller (Modified), Fred Dmuchowski Jr. (Sportsman) and Al Boytis (Super Stock). Drivers Sam Martz (Modified), Lou Farina III (Sportsman) and George Quinlan (Super Stock) received Determination Awards for their perseverance throughout the season. Ron John Koczon (Modified), Jeff Geiges (Sportsman) and Spider Ensinger Jr. (Super Stock) were named New Egypt's Stars of Tomorrow in their respective divisions. Best Appearing Car Awards went to Tim Tanner Jr. (Modified), Mike Krachun (Sportsman) and Kevin Bifulco (Super Stock). Super Stock driver Jake Roveda was awarded Best Victory Lane Interview. For triumphantly battling back after suffering a broken arm in a nasty early-season wreck, 2005 SS Sprint titlist Art Liedl Jr. was presented the track's first-ever Spirit Award. Rich Roveda Jr., crew chief for his brother Jake and key man at the speed shop that produced three of the top 10 Super Stocks, was presented with Mechanic of the Year honors. For his positive attitude and weekly support of the track's fan programs and Kids' Club, Sportsman driver Chad Barney was the recipient of the Sportsmanship Award. In addition, 47 drivers were presented with Loyalty Awards for perfect attendance in 2005. Corporate sponsors and others receiving special recognition for their support and involvement in the speedway's continued success were Vespia Tire & Auto Care; Perlmutter Family ShopRite Superstores; Haldeman Ford; Racing Electronics; Advantage Financial; and Cradle Rock Developers. A New Egypt Speedway Employee Recognition Award, along with an American Racer jacket, was presented to pit steward Clay Butler. Saturday's banquet concluded all racing activity at the speedway for the season. Earl and Doug Megill will be hosting their annual Fall Racer's Flea Market on the track grounds on Saturday, December 3 from 7:30 am to 2 pm. For more info on the flea market, contact Earl Megill at (732) 681-3776 after 6 pm. Over the winter months, news will be forthcoming regarding the 2006 schedule for New Egypt Speedway's "big" half mile track, and also the newly added Quarter Midget dirt oval -- Little "E" -- and a yet-to-be constructed one-fifth mile inner track. For all the latest updates, sign up for the track's free "Friends & Family" email news service on the official website: www.newegyptspeedway.net . For further information, contact the speedway office at (609) 758-1900. On Sept 28th Brooke Kennedy, 78, passed away in his residence in Birdsboro, Pa.
Brooke was co-owner of the Kennedy Race Team. Beader Kennedy, Glenn Fitzcharles and Sammy Beavers are just a few of the drivers that raced for the Kennedy Race Team. The #98 and #56, participated at tracks throughout, PA, NJ & NY from 1965 to 1977. The viewing will be held on Sunday, Oct 2nd from 6:00-7:30 pm in the funeral home. Services will be held on Monday Oct 3rd at 11:00am in the Dengler Funeral Home in Birdsboro, Pa. Internment will be in the Birdsboro Cemetery, Union Township. Many will remember Mr. Alston in the stands many years ago, encouraging young Warren to pursue his dream of being a Flagman. Services were held on Sept. 28, 2005 at Huber-Moore Funeral Home in Bordentown, NJ. Our condolences go out to the family of Warren Alston on the passing of his father Al. Walter Pete Clark, 86 years, of Glassboro, N.J., died on Sunday, Sept. 4, 2005 in the SJ Hospital System-Elmer Division. 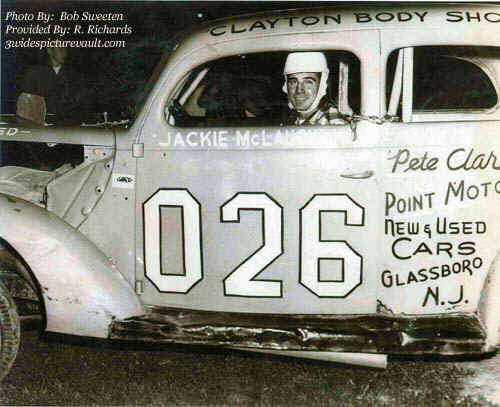 Pete sponsored many cars including the #026 pictured above from the 50's with Jackie McLaughlin behind the wheel, the #026 driven in the 80's and 90's by Newt Hartman, and many others. Our Condolences go out to the Clark Family. It is with sadness that I must inform you that a Pitman Centennial Alcyon Speedway Reunion attendee has passed away. 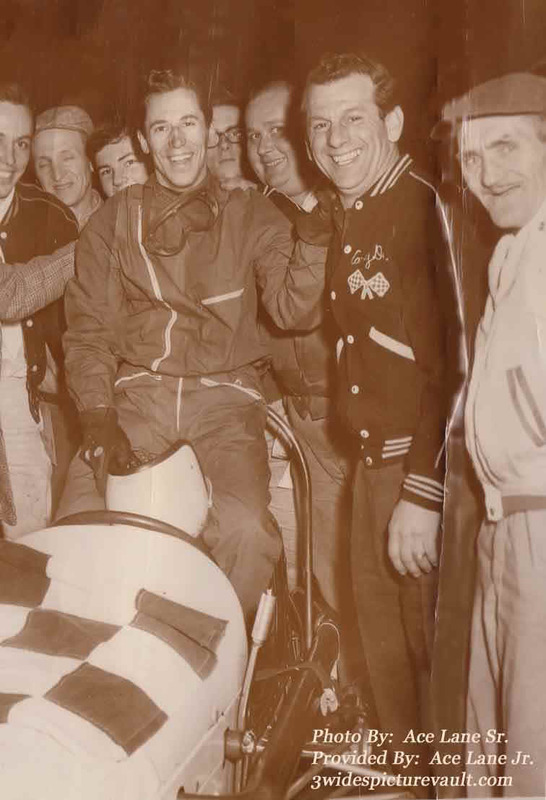 Pitman resident, Bill Thomas, who raced from the late 1940's into the mid 1950's, passed away earlier this weekend. SAYLORSBURG, PA  APRIL 1, 2005 - C.A.T. Products, Inc. (RUN-RITE�) is proud to announce its sponsorship of IndyCar� driver Danica Patrick as the featured part of its 2005 "Driving Business To YOU!" advertising campaign. As a leader in the professionally installed, automotive preventative maintenance industry, RUN-RITE� recognizes the need to create greater consumer awareness of the need for regular fuel system cleaning. "By utilizing Danicas world-wide exposure as an up-and-coming driver in the IRL, we hope to create more consumer interest in fuel system cleaning and greater awareness of the RUN-RITE� brand," said Gilead D. Stallard, president and chairman or C.A.T. Products, Inc. "Danica is a remarkable driver with amazing composure and unmatched determination to be the best. We couldnt be prouder to have her as our 2005 spokesperson." This attractive 5-foot-2, 100-pound woman, battles in a man's world with amazing success, and shows the determination to become one of the nation's brightest sports stars. Considered by many as the first female driver capable of winning the Indy500, Danica is one of the nation's best young auto racers, and currently drives the #16 car for Rahal-Letterman Racing in the IndyCar� Racing League (IRL). She also hosts SpikeTVs "Power Block" which airs on Saturday afternoons and Sunday mornings. Finished third in the 2004 Toyota Atlantic Championship, the highest finish by a female driver in the series history. Posted 10 top-five results and three podium finishes in 12 starts. She finished second in Round 4 at Portland and claimed third place results in Round 2 at Monterrey, Mexico and Round 6 at Cleveland. Became the first female driver to lead an open-wheel championship when she took the points lead of the Toyota Atlantic Championship after Round 4 of the 2004 season. Captured the pole position for Round 5 of the 2004 Atlantic Championship. She is the first female to capture the pole position for an Atlantic race. Won the 2002 Long Beach Grand Prix Pro/Celebrity event in the pro division, topping four-time Trans Am champion Tommy Kendall and former IRL driver Sarah Fisher. Three time national karting champion and ten time Great Lakes/Midwest regional karting champion. For more information about Danica Patrick, contact O. Lynn Roach, Jr. at (703) 648-1717. Founded in 1994, RUN-RITE� is a leading provider of professional automotive preventative maintenance products. They provide specialty cleaners, treatments, lubricants and equipment to the professionally installed automotive service and quick-lube markets. Their complete "Vital Signs" program encourages maintenance of the following key automotive components: the Fuel System, Transmission, Engine, Cooling System, Power Steering System and Brakes. In addition to industry-leading chemistry, RUN-RITE� provides its customers with excellent customer support, onsite training, certification programs, and hi-impact sales material - including a new interactive waiting room DVD. Vince Conrad at the wheel of a Melvin Joseph owned Sportsman at Old Bridge, NJ. Melvin Joseph, who was instrumental in building the dual purpose Dover (Del) Downs facility, including the high-banked one-mile oval, died Wednesday at age 83 after a brief illness. The Georgetown, Del., native oversaw construction during the late 1960's of the auto racing facility and the 5/8 mile horse track. 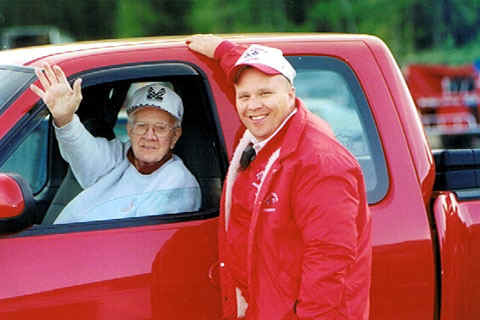 Joseph has been a constant fixture at Dover International Speedway events, giving drivers the command to start their engines at every NASCAR Nextel Cup Series race since 1969. At the time of his death, Joseph served on the board of directors for Dover Motorsports Inc., as vice president and director of Auto Racing for Dover International Speedway. He also served on the board of Dover Downs Gaming & Entertainment, Inc., Joseph was originally appointed to the board of what was then Dover Downs, Inc. in 1969. "Over the years Melvin contributed a great deal to our organization", said Denis McGlynn, CEO and president of Dover Motorsports, Inc. and Dover Downs Gaming & Entertainment, Inc. "We are grateful for his willingness to share his knowledge on our behalf, and for his lifelong dedication to our efforts. He was a most valuable contributor to our success." Eleven years ago, Joseph, who was owner of Melvin Joseph Construction, oversaw the complicated repaving project at Dover that transformed the asphalt into the current concrete surface. Melvin Joseph fielded cars as far back as the Beach Days at Daytona. His cars were always a force with great drivers like Joe Weatherly, Fonty Flock, and Banjo Mathews, to name a few. In the later 50's Ken Marriott and Reds Kagle drove fairly steady for Melvin. The picture above shows Vince Conrad at the wheel of a Melvin Joseph Sportsman at Old Bridge. (White car with Red trim). Joseph's engine builder Bob Wallace from Baltimore, who Melvin would always call Robert, told me how in the Daytona Modified race they had Banjo Mathews destroying the field and the engine came up "lame". When they were ready to head South with the race car they needed a battery. Melvin had one he carried in his car to be used in equipment on his construction sites, if needed in emergency. He made them use it because it was his "lucky" battery! During the race the pole/terminal broke loose from vibration and caused the car to falter. Not a "lucky" battery after all. Richard "Job" Adams, 54 of Egg Harbor Township passed away on April 5th. Job built and drove his #2 coupe at Atlantic City Speedway in the 70s. He also was a model stock car builder, many of which he proudly displayed at the track. A Memorial Service will be held at 3pm on April 9th at the Adams and Perfect Funeral Home, 1650 New Road, Northfield, NJ. 3 Wides Picture Vault (www.3widespicturevault.com ) would like to welcome B&B Machine Shop, Inc., of Toms River, NJ as their newest sponsor. Barry Hulse is the owner of B&B Machine, and is a former competitor of the Sportsman division at Wall Stadium (1979 through 1983). Barry also ran with the NASCAR Modifieds on the asphalt of New Egypt Speedway and was Wall Stadium's Chief Technical Inspector from 1985 through the 1990 season. As owner of B&B Machine Shop, Inc, Barry also built numerous winning race engines for the old Street Stocks and MADS in the early 1990's. Barry is a frequent contributor to the website and describes himself as excited and proud in becoming the sites newest sponsor. "3 Wides Picture Vault is performing a wonderful service in preserving and documenting the rich and storied history of short track racing here in the northeast" explained Barry. "I am very pleased to sponsor the site. 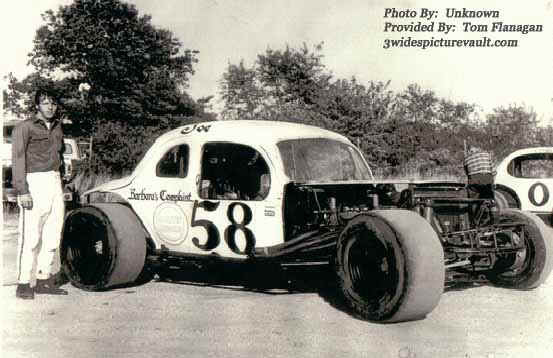 It is, by far, the best on the web for old time Modified-Sportsman racing!" Barry describes B&B Machine Shop as the automotive machine shop that the local auto parts stores all used to have in the back of their store. Everything from complete engine overhauls, flywheel grinding, cutting drums and rotors, cylinder boring, valve jobs and more. Discounted auto parts, hard to find antique engine parts and lots of industrial and tractor parts are all available at the shop. From Jeff Gravatt: "As of today, March 24, I am no longer the operations manager at Wall Speedway. At this point any future questions or dealings about the track should be directed to the office where Stacey or Fred will handle them." From the Vault: Jeff has given a lot to the sport over the years and I'm sure that nobody is more upset with the recent events at Wall than Jeff. I understand that Jeff has accepted a request by current track ownership to stay involved in a Public Relations capacity, howver, Jeff has a lot of experience in outside sales in the Automotive Industry, along with a good background in public relations. If you or someone you know is in either of those industries and is looking for a great guy to get on board with your team, you can contact us here at the Vault and we'll pass the info on to Jeff. In addition to securing a new sales and/or public relations position, we hope Jeff continues his involvement in the sport at a speedway and/or with AARN. Ray Mount passed away Tuesday. 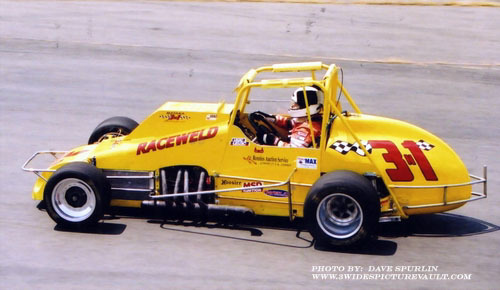 Ray built and owned a few different cars from Wall and New Egypt in the 70's and 80's that Rick Sendzik and Eddie Geibel drove, and my father (Barry Hulse) and Ray built my #34 Sportsman in his garage. Our condolences go out to the Mount Family. Jim Habermehl passed away on March 10th, 2005. Jim built and owned the #73 modified that Tom McAndrews drove at Atlantic City Speedway. 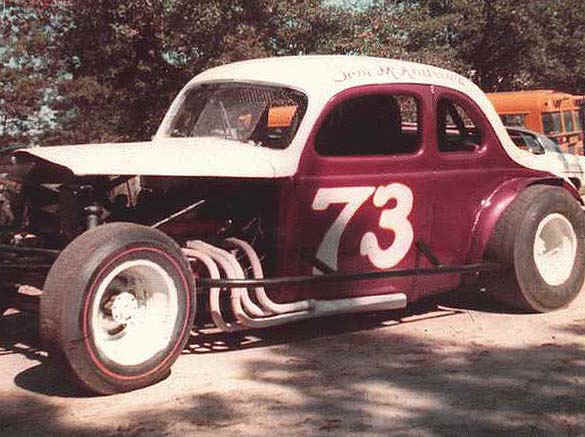 Jim also drove the #73 at Pleasantville Speedway and recentely helped Tom McAndrews build his newest car (also #73) that was on display at this year's Pumpkin Run held at Fleming's Auto Parts in October 2005. Jim lived in Farmington and was past chief of the Farmington Fire Department. 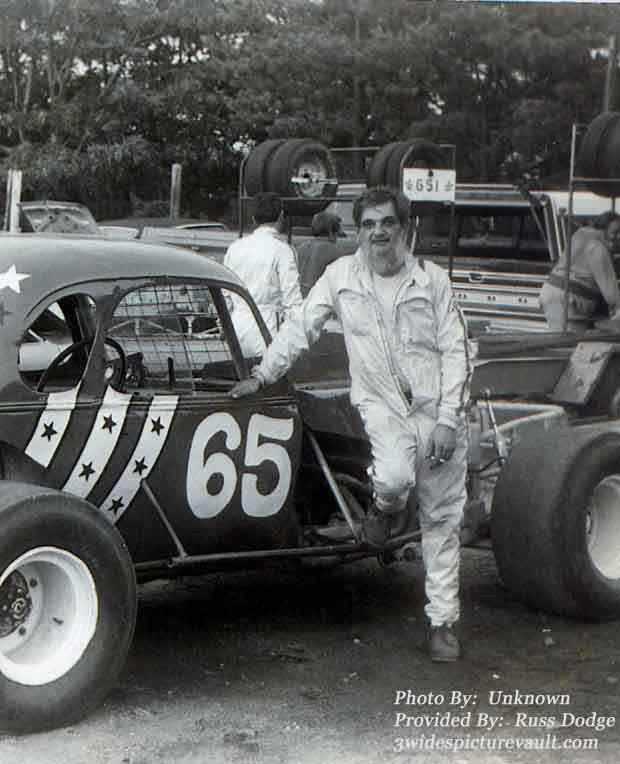 William (Bud) S.Boekenkamp, the third driver of the #65 modified at Pleasantville, passed away on 3-3-05. Bud was 75 yrs old. 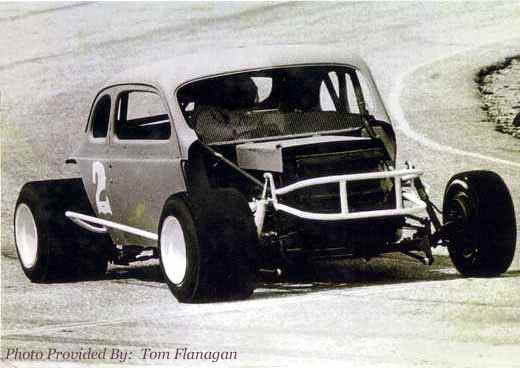 According to www.AtlanticCitySpeedway.com 's host Tom Flanagan, Bud lived in Egg Harbor Township and drove both modified and late model cars. 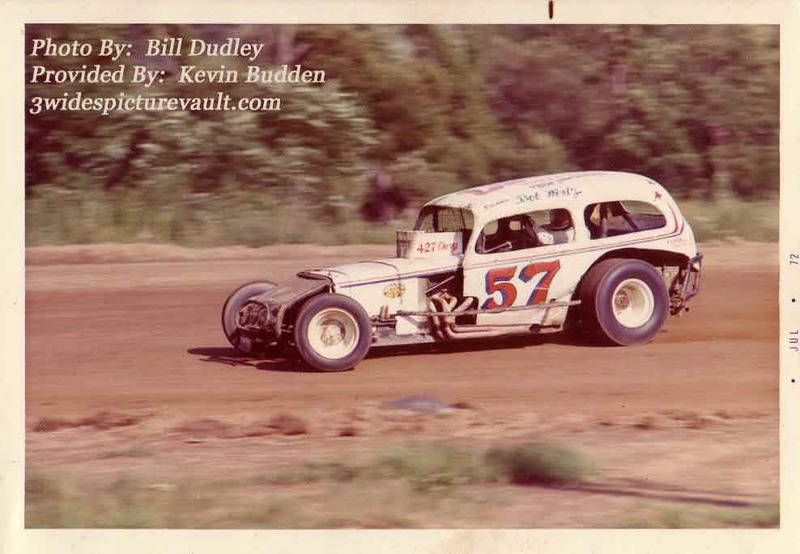 Racing Historian Russ Dodge provided the 1970's photo of Bud at the Atlantic City Speedway below. 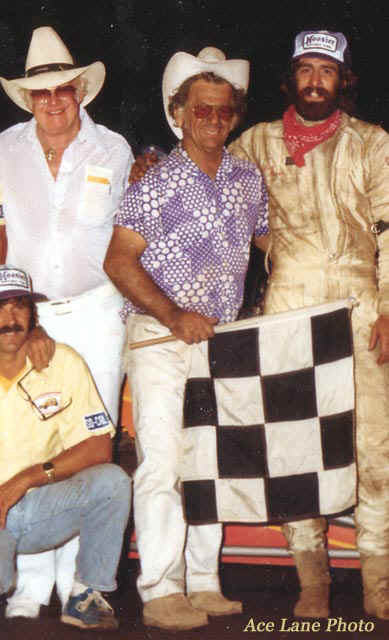 Russ added "He wasn't a feature winner but loved to be part of the sport. What most people won't know is that he was a scorer of the races at Vineland speedway along with his sister Joyce (Clark) Thomas." Joe Schmutz has passed away. He was 62 years old and was from New Gretna, where he owned and operated the New Gretna Gulf Station. 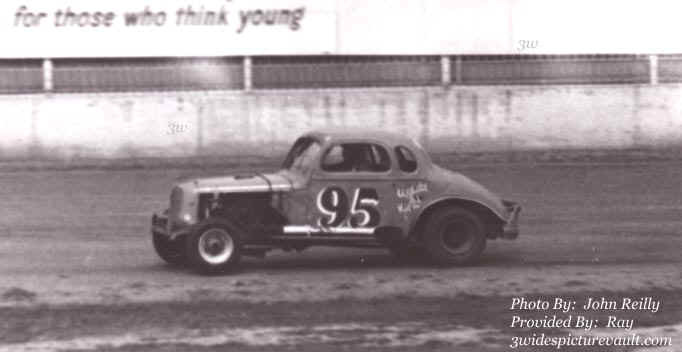 Joe drove the #58 car at Atlantic City Speedway. We will miss you Joe. SCHMUTZ, JOSEPH, 62 - passed away February 19, 2005. Born in Camden, he lived in Pennsauken before moving to West Creek in 1960 then to New Gretna in 1969. He worked for Hanselman and PHA Inc. on and off for 35 years. Mr. Schmutz also owned and operated Schmutz Gulf Gas Station from 1978 to 2001. Mr. Schmutz is an army veteran. He loved stock car racing, building and driving his own cars at Atlantic City Speedway and Wall Stadium. He leaves behind a wife Barbara and a son Joseph. One of the visitors of our site passed along the following information: "Harry was a very caring man. He often showed me his scrapbook of his midget racer #25 that Mario Andretti drove. I became very good friends with him, since he lived near me in Piscataway here. Me & my wife spent many Sunday afternoons at his house watching Nascar races & eating his pasta dinners. We spent many February speedweeks staying at his Tampa home. A lot of great memories. Now they have a great flagger up there with all those great drivers." We at The Vault send our condolences out to the Dee Family and can only add that Harry will always be in our memories, having been such a big part of our nights at the Speedway. As the late Bill Singer said so many times each night at Flemington, "Harry Dee looks them them over...."
Harry has a great view now as he takes his place with so many that we will always remember. 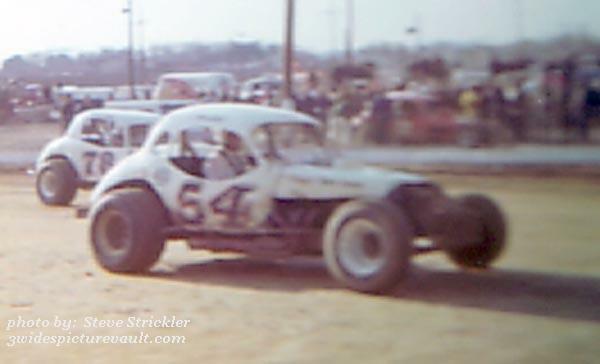 Race driver Earle Collins, (driver of the #62 at many South Jersey Speedways) passed away on Jan 7th at the age of 89. 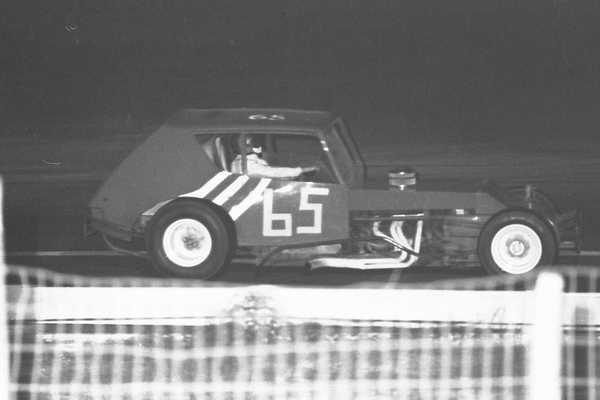 Earle is pictured here behind the wheel of his #62 hobby sportsman in this Walt Chernokal photo taken at Pleasantville Speedway in 1958. Earle passed away on January 7th at the age of 89. Racing Historian Russ Dodge notes that Earle was a flyer and maintained his by-plane at Cape May County Airport up until his death. "Earle invited me down to see his plane several years ago." 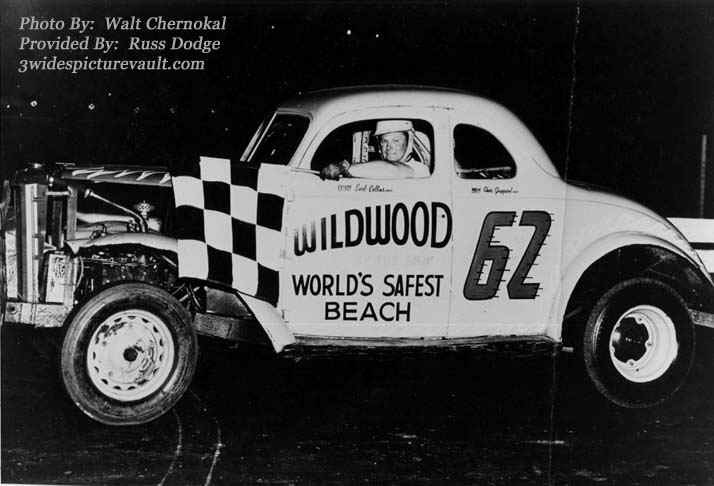 Russ also adds, "His cars were alway nicely maintained and sported the Wildwood - by- the - Sea theme. Earle's cars often had wave shapes painted on them to look like the ocean. He owned a fence company and was at the reunion in Elmer... a real nice gentleman." presentations were made in celebration of the 2005 racing season, as Bridgeport Speedway presented "A Night of Champions." Duane Howard walked away with the bulk portion, collecting a whopping $10,000 in cash awards for the third time in four years - the #126 team, which will dissolve at the end of the season, as Hynemann steps out and Howard heads to the BPG Racing stable of Chad Sinon, ended the season with six wins and 21 top five finishes. Bridgeport Speedway Young Gun, Sean Carman of Stockton, NJ, was set in the spotlight after capturing the Sportsman Championship on the final night of action - the twenty-one year old, Carman, gave much of the credit to his parents, Dean and Nancy for helping him capture his first championship. Pat Conaway dominated the Outlaw Stock division and captured the championship easily after collecting 13 wins, 11 of which came consecutively. Jasper Sprint crowns on back-to-back nights, becoming the first driver to win two titles in two separate divisions in the same season. and pick up at the event. Bridgeport Appreciation Bob Brown, Sr. I don't know it anybody told you guys or not former Shangri-La, Penn-Can, Nazareth, Langhorne, etc, etc. photographer Fred Smith recently passed away at the age of 68 in Windsor, New York. A lot of Northeast racing people knew Fred as a jovial, fun loving guy who took racing photos. His wife Miriam still has a number of his photo albums from the 50's thru the 80's although most of his racing negatives were sold to John Grady. Fred was a fun guy and had a lot of fun doing what he did. Just thought you guys might like to know this. Thanks. We are all saddened at the news of the passing of Barbara Towels. Many race fans will remember Barbara and her smile week after week rooting for her favorites at New Egypt Speedway. Our condolences go out to husband Harvey and the Towles Family. Racing has lost one of its best. HAMILTON, NJNow in its fourth year, JD3Graphics of Hamilton, NJ has successfully established itself as one of the premier design companies in the motorsports industry. JD3Graphics is fully owned and operated by the Dugan family, whose perseverance has expanded the company from a part-time hobby into an all-inclusive graphics provider. Here at JD3Graphics, we always strive to provide our customers with the most unique designs. This year we are proud to be able to offer our customers artwork that not only can be applied to their racecars, but also to a number of new productsincluding t-shirts, autograph cards, and embroidery. says Jay Dugan, proprietor. These items will not only complement the customers' existing products, but will make several other options available in order to increase driver recognition, create a unified team identity, and develop a greater sense of professionalism among owners, drivers, and crews. We have also recently become a distributor for Awesome Racewear. Their race suits and uniforms are available with many options and a variety of customizable designs. Awesome Racewear products are worn and recognized in virtually all types and levels of motorsports, from local go-kart divisions to national NASCAR touring circuits. What we feel sets us apart is our ability to show our customers renditions of their racecars, racesuits or other products before they buy them. That way, we can get our ideas closer to what was in the mind of our customer and take the guesswork out of the whole process. We want to provide a professional atmosphere for our customers and their race teams. By using unified designs on a number of products, their team automatically becomes more visible and more recognizable. Even better, the customer ends up saving time and money by getting all of their products in one place, comments Dugan. Further, JD3Graphics can extend the logo designs on the racecars to the sponsors themselves, providing the same integrated design concept for the commercial consumerincluding: logos, business cards, letterheads, signs, brochures, company vehicles, and websites. With top race teams such as Lowes Dirt Track Winner Ricky Elliott with the Jake Marine Megateam #85, New Egypt Speedway Modified Champion Jimmy Horton with the Hewlett Motorsports #901, Delaware Intl. Modified Champion Craig Mullins, as well as the M&M Motorsports #711 of Mike Iles, JD3Graphics is wrapping up a successful 2004 season and is looking forward to an even more successful 2005 season. 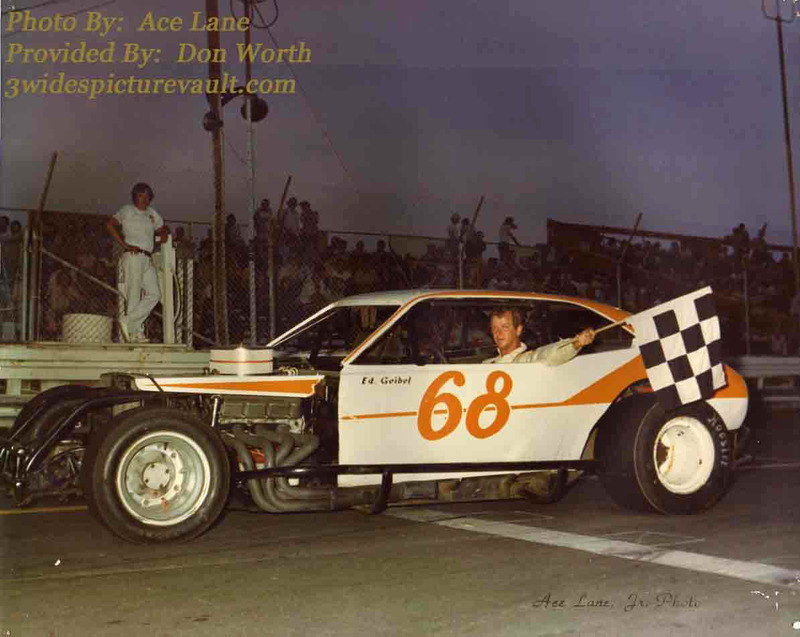 I just want to let everyone know that on Monday Dec 6th, Bob Wertz, owner of the #57 cars that ran at Reading from 1955 to 1975, passed away at the age of 69. Such great drivers as Hal Reifinger, Dave Cordier, Bill Williams, Bobby Gerhart and Kenny Brightbill drove for Bob. His funeral was held on Friday Dec 10 at the Milkins Funeral Home in Temple Pa.
Our condolences go out to the Wertz family. William B. Mataka, 74, of Clinton Township, N.J., died Friday, December 3, 2004, in Morristown Memorial Hospital, Morristown, N.J. Born: July 20, 1930 in Maplewood, N.J., he was a son of the late John and Susan Kubek Mataka. He had lived in Maplewood until moving to Clinton Township in 1976. He was co-owner of Raceweld, a welding and fabrication shop located in Lebanon, N.J. He was heavily involved in Silver Crown Auto Racing and in 1963, his car, driven by Mario Andretti, won three races in one day. With Frankie Schneider at the wheel, The Mataka "3N1" takes a few final laps around the Flemington Speedway. He was a member of Holy Trinity Lutheran Church in Union, N.J. He was also a Life Member of the United States Auto Club Antique Car Club and the 200 Club Police Benevolent Association. He is survived by two brothers, Charles and his wife, Elizabeth, of Short Hills, N.J., and Edward, of Clinton Township, N.J., and a sister, Helen Mataka, of Clinton Township, N.J.
Services: 11 a.m. Tuesday in the Scarponi-Bright Funeral Home, Lebanon, N.J. Call from 2 to 4 and 7 to 9 p.m. Monday in the funeral home. Entombment will be in Hollywood Memorial Park, Union, N.J. Memorials: Contributions may be made to Seeing Eye, P.O 375, Morristown, NJ 07963-0375, or to SPCA Animal Shelter, 576 Stamets Rd., Milford, NJ 08848. Chuck Lamb passed away this past Monday night after a long battle with cancer. He was a trooper to the end. Many people who met Chuck in recent years had no idea he had health problems. He was able to handle all the health problems (the chemo treatments), his daily job and his PHILLYRACING.COM website without skipping a beat right up to the last couple months. Chuck was a big booster of local short track racing as could be seen by his www.PhillyRacing.com website. He was a regular visitor to many of the area short tracks and was a very active member of the Eastern Motorsport Press Association. His parents, oldest sister and his wife were with him in the final moments. The family has requested that donations be made in Chucks memory to Colon Cancer Research c/o American Cancer Society, 1615 West Chester Pike, Suite 102, West Chester, PA 19382. The viewing will be at 9:30 a.m. on Saturday at the Stretch Funeral Home, Eagle and St. Dennis Rds. Havertown, PA. The funeral will follow at 11 a.m. Additional information and directions can be found at www.stretchfuneralhome.com. All of us who knew Chuck will miss him and, as we told his wife Susan, we express our deepest sympathies to his family and friends and will remember him fondly in our prayers. Passing of Chip Cresse - Former Bridgeport Starter and "One of the Most Active and Most Dependable Volunteers in the History of Gloucester County"